MASKerade: Cath, You are the Moxie-Fab-Best! Cath, You are the Moxie-Fab-Best! This is my second post today. For my Thanksgiving Inspiration Crew post, please scroll down. Welcome to what is probably the biggest blog hop in papercrafting history! We are all still reeling from the news that Cath is leaving Papercrafts, but that didn't stop 285 of us from doing what we do best - making a card to mark the occasion! Cath - we all wish you the very, very best as you move into the next exciting chapter of your career. We will miss you, but your legacy of Moxie Fab-ness will live on! You're the Moxie Fab-Best! Below is the list of all the participants in this blog hop - I'm number 109, in case you're trying to figure out where you are! Ardyth this card is stunning! wow totally fabulous card.. love how you added the color..
Love this card so perfect! Yep, Ardyth, this card is a perfect way to say thanks to Cath! Well done, a wonderful card! You're so right - she's the moxie fabbest! Love the pastel colors with the dark grey. I have been on such a 'font' mission lately and every time I see one that I like, I jot it down. And...I'm loving this font...is it a Silhouette file? love the card! that die or whatever it is is awesome! This is fab! Love the colored stripes!! This is SO Moxie Fab! Love your graphic creation! Ardyth, this is amazing! So gorgeous! So very pretty, love the "rainbow"! A stunning card to say the least. Its simplicity and CAS design are just what the occasion needed. Your cards are always awesome on a stick! Love it! LOVE this card Ardyth! So so fabulous! This card ROCKS!!! That is all. Ardyth this is totally Moxifabulicious! If I were to see this in a pool of cards, I would know it was an Ardyth card! Love it! Beautiful creation - love it. so super cool! love the dark background against the colorful stripes! Rainbow amazingness, Ardyth! Love the precision! You rock at CAS cards...this is no exception, Ardyth! Adore your epic card! And thanks for the lovely e-mail of encouragement,too! I really appreciate it! So happy that you are part of this epic blog hop! really cool card! 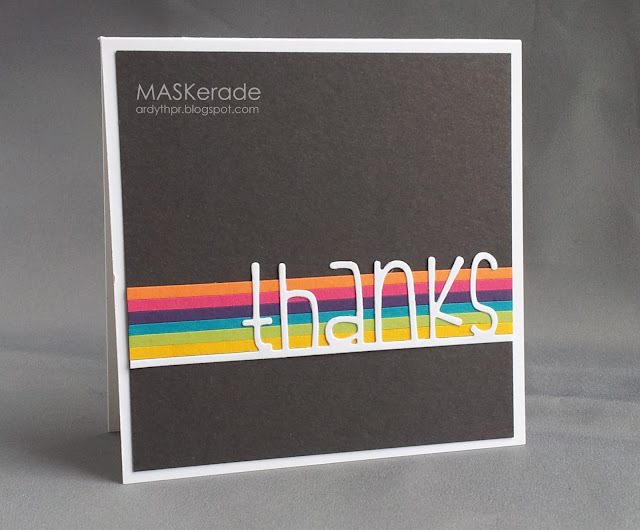 I love that you were able to make a fab card using just paper. awesome! All I can say is wow, Ardyth! Love it! Beautiful! I love the stripes against the black!